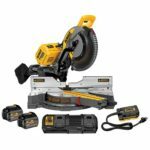 Deal on the DEWALT DW715 15-Amp 12-Inch Single-Bevel Compound Miter Saw for $185. 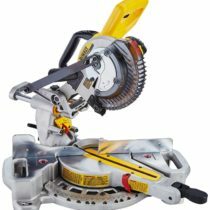 It uses 12 inch blades and doesn’t slide and is only single bevel. This is the step down model of the DW716 which also dosn’t slide but features double bevel. 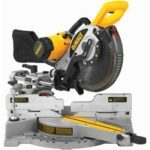 Its a great 12 inc miter saw for the price if you don’t need a slider or double bevel. 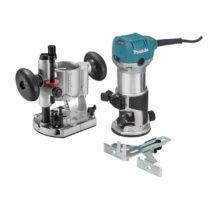 Adjustable stainless steel miter detent plate with 11-positive stops delivers repeatable accuracy and worksite durability. Tall sliding fence supports crown molding up to 5-1/4″ nested and base molding up to 6-1/2″ vertically against the fence while easily sliding out of the way for bevel cuts. 0-48 degree to the left and 0-3 degree to the right for increased capacity. 0-50 degree left and right miter capacity for greater versatility. Cam lock miter handle with miter detent override deliver quick, accurate miter angles. 4-hardened steel bevel stops at 0, 33.9, 45 and 48 degrees. Lightweight with built-in carry handle for easy portability. STANDARD EQUIPMENT: Carbide blade, extension kit, dust bag, blade wrench. 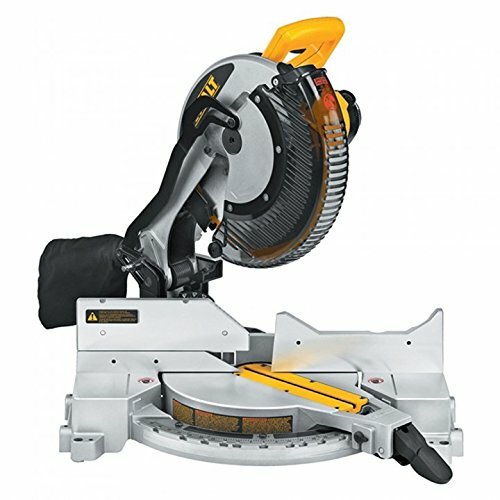 SPECIFICATIONS: 15.0 amps, 4,000 RPM no load speed, 12″ blade diameter, 5/8 or 1″ arbor size, 6-1/2″ vertical capacity baseboard against fence, 5-1/4″ vertical capacity crown molding vertically nested, 8″ horizontal capacity baseboard lying flat, 6-1/2″ horizontal capacity crown molding lying flat, 2 x 8″ for 45 degree bevel cut capacity (dimensional lumber), 2 x 8″ for 90 degree cross-cut capacity (dimensional lumber), 2 x 8″ max width for 90 degree cross-cut capacity, 4 x 6″ dimensional lumber max height for 45 degree miter cut capacity, 2 x 6 dimensional lumber max width for 45 degree miter cut capacity, 42 lbs. tool weight. Stand Not Included.